The PuSh International Performing Arts Festival and Coastal Jazz present the Canadian premiere of the stirring multimedia experience dirtsong, February 4, 2017 at 8pm at the Queen Elizabeth Theatre. 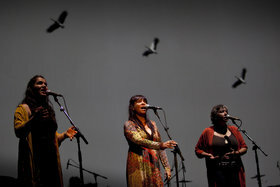 Drawing on 40,000 years of tradition, Australia’s Black Arm Band, the spectacular ensemble specializing in Aboriginal music and languages, pulls audiences into sweeping and intoxicating visions of its Indigenous peoples and homeland – from vast plains to outback communities. Against a backdrop of stunning documentary, with driving percussion, didgeridoo, and deeply soulful vocals, the group performs songs in a dozen languages, including some now virtually extinct. Touring for the first time in Canada— in the 150th year of a nation born from the displacement of its Indigenous peoples—dirtsong is more poignant than ever.